With the weather warming and the days getting longer we are ramping up the time spent at our allotment. We got it in the Autumn last year and weren't expecting much produce off the neglected plot with a good covering of perennial weeds like dock and a large area covered in morning glory. 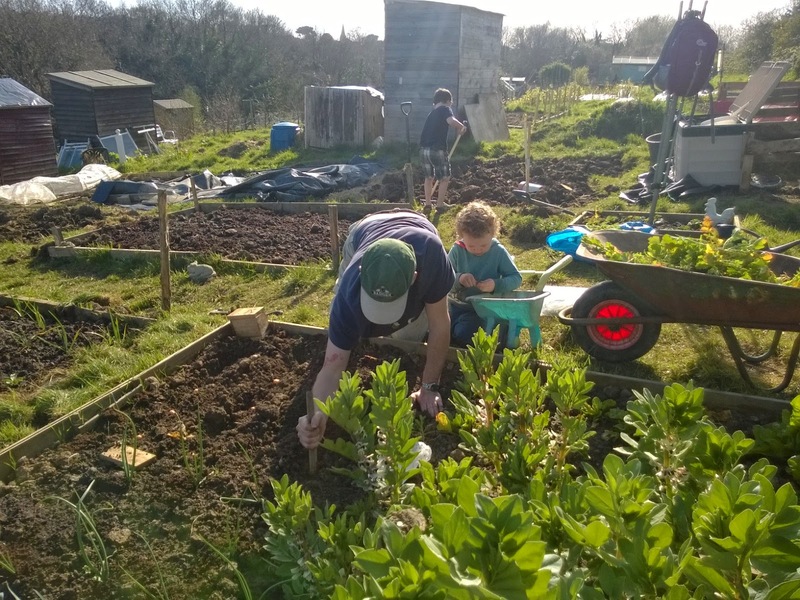 We cleared one bed straight away and boxed it in with old planks found on the plot, and planted it up with broad beans, onion sets, leaf beet, leeks, turnips, radishes and purple sprouting broccoli. To our great surprise everything survived and we have enjoyed plenty to take home already, with the PSB being a particular favourite after recovering miraculously from serious pigeon damage to provide us with several tasty meals. 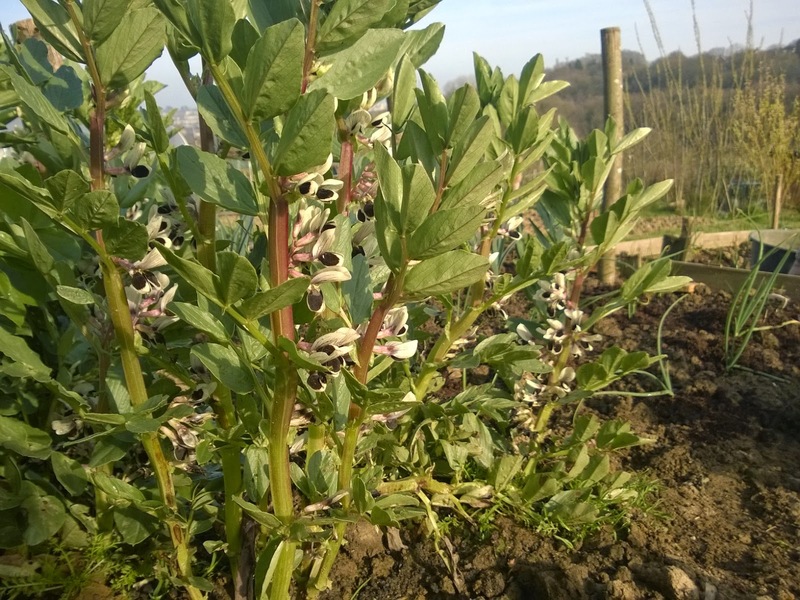 As you can see the broad beans are in full flower, although I may need to help them along in the pollination department as we seem to be largely devoid of bees (I have sowed calendula and nasturtiums to try to encourage them in later on in the year). I planted shallot bulbs in between the beans and the PSB which are starting to sprout happily in the shelter of the larger plants (which will be cut off when done and the roots left in the soil). There's really good points about the plot - south facing slope, good access to water. This should help us overcome the challenges - heavy clay soil and quite exposed so the wind dries the clay to rock pretty quickly. We're mostly concentrating on getting the soil right this year - wood or turf edging around the beds to help stop the soil washing off down the slope, removing the problem weeds, adding organic material and nutrients to the soil. Consequently we're probably over planting with 'boring' crops like potatoes (the shade from the leaves will help to suppress weeds and clear new beds) and onions (at 50p a bag for sets from Lidls it makes the likely failures less upsetting). Later on we'll get in other reliable crops that we've sowed at home, including French beans and courgettes. 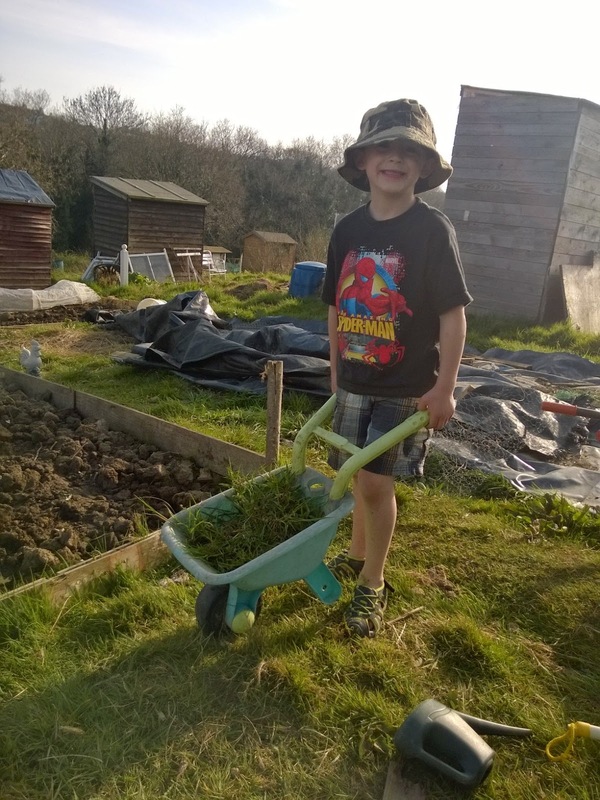 The boys are desperate to get up to the allotment, where they can run around all afternoon in the sunshine, make sculptures from the clay, dig, water and wheel barrow fulls of weeds up to our compost bins (which we found under the bindweed and have repaired). It's good exercise for all of us and there's growing evidence of the myriad health and well being benefits of gardening. It supports the kids in developing a really healthy relationship with food and an awareness of just how much time, water and other resources goes into producing food. We've never wasted much and this explains why to them. Including foraged from site nettle tops, clevers and plantain leaves that joined our leaf beets in a yummy balsamic vinegar and tomato sauce this week also means that they get the benefit of a good boost of vitamins and minerals from the very freshest of fresh food. The biggest challenge? 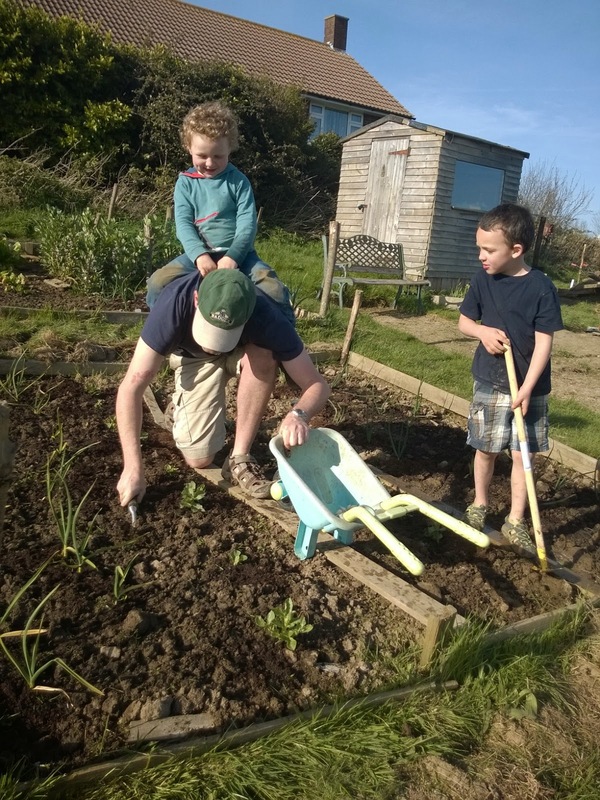 So far it's planting onions while being ridden as a horsey (I noticed at least a couple go in upside down).